This leak detection pump is one of the highest quality replacements on the market! Also referred to as a "LDP"
This leak detection pump is built to strict quality control standards, makes a great replacement, and has substantial cost savings over an assembly from the dealer. Product shipped quickly and was a perfect fit. Fixedy check engine light. The video did it for me! 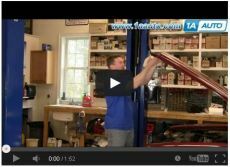 Not only did you have the part (on sale)-the install video made the job extremely easy. You guys just made the top of my list to go to first. Keep the vids coming as a vehicle noob such as myself need them badly.